iBall – a brand known for its innovative and latest technology products brings in yet another addition to its growing portfolio of Andi Series smart phones with ‘Andi 4 IPS Tiger’ – its heroic 4 inch IPS display with the very robust Quad Core processor, combines productivity with performance, slated to be a complete smash hit among the 4inch range of smart phones. Spot-on to its title, Andi Tiger is one of the first few smart phones in the 4-inch Display which brings in hosts of features in the gadget like never before in its segment. Andi Tiger riding high on its blazing speed with 1.3 GHz Quad core, cortex A7 processor allows running multiple apps without any lags building an amazing gaming experience. It’s 4 inch IPS display with a super responsive and smooth capacitive touch makes the viewing experience from all screening angles, bringing in superior quality supported by superior graphics. It is available in two variants i.e. with 512 MB Ram and 1 GB Ram. Supported with 4GB memory which is expandable up to 32 GB enables the user to store wide range of apps and data of music and files. Further its 3G HSPA+ Download link 21MBPS and 5.6MBPS upload speed allows the user to instantly connect and share, making work possible on the go. The front eye of Andi Tiger allows both 3G Video Calling and the much in fashion – clicking‘selfies’followed by its 5MP rear camera with its LED flash that gives you perfect shots. Running on Android 4.2.2 it comes packed with the latest features allowing the users to enjoy seamless multitasking and an immersive gaming experience, that’s even more exciting with the superior graphics. Adding further to its user convenience, it allows Bluetooth tethering, USB tethering and WiFi hotspot to instantly connect and make work possible on the go. Smoothening the connectivity issues are its GPS and A-GPS capabilities. To keep users entertained it comes with FM radio & the auto call recording feature that records and stores all the conversations. 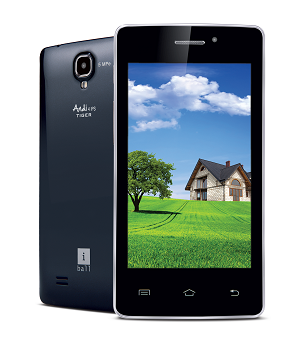 Andi 4 IPS Tiger is affordably priced at best buy price of Rs.6, 599/- (MRP of Rs. 7,199/-) for 1 GB version, making it the most attractive buy in the buzzing mobile market.